It’s always an exhilarating experience to take on a full kitchen remodeling project and watch it come to life. I’m pleased to unveil the before and after shots from one of my recent projects — a South End kitchen renovation which was also featured recently in The Boston Globe. The transformation between this kitchen’s initial layout and its final design was such a success that the new space is hardly recognizable from what it used to be! 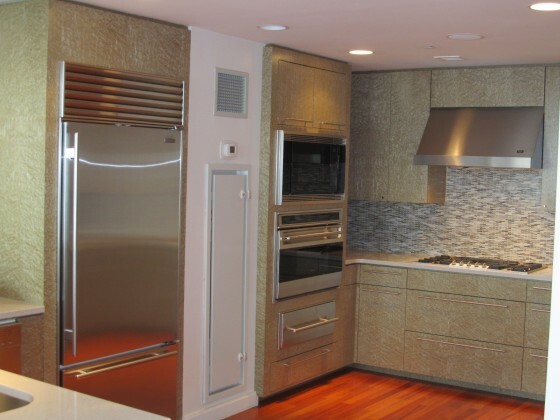 Before the renovation, the kitchen of this Boston condo lacked flow, comfort and aesthetic appeal. 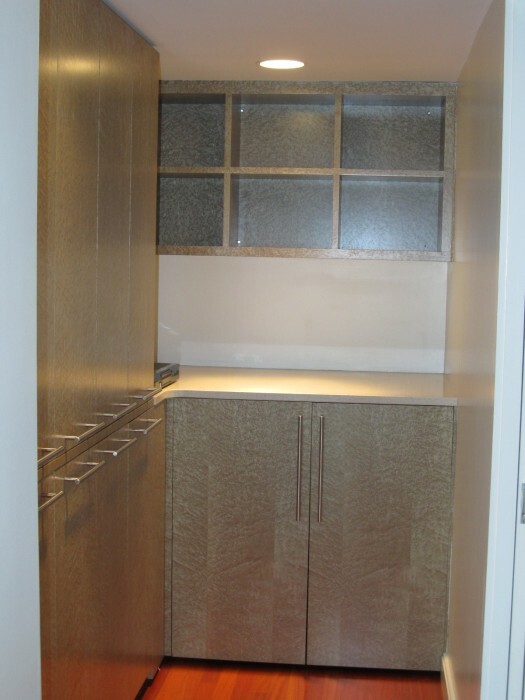 The layout was cramped and choppy due to an adjacent pantry space and a narrow laundry room. Another challenge faced was finding a way to work around the areas that couldn’t be moved or altered because of the condo’s duct work and piping. As you can see from these photos, the overall design lacked visual interest and appeal. 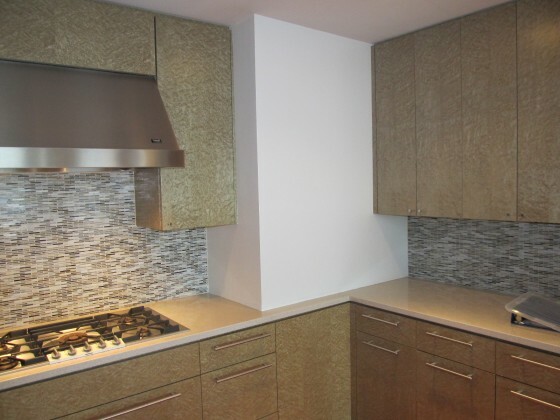 Not surprisingly, when my clients purchased the property, the kitchen upgrade was a priority. 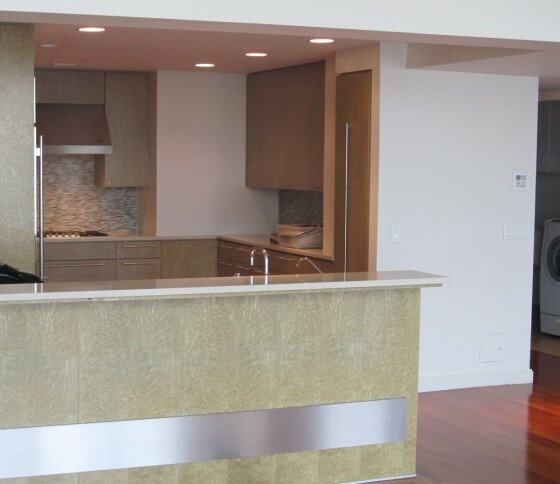 What they desired was an open and elegant contemporary kitchen that was fully equipped with high-tech features, appliances and amenities. We opened up the space and created a seamless flow by removing multiple walls and integrating the former pantry space and former laundry room into the new kitchen design. 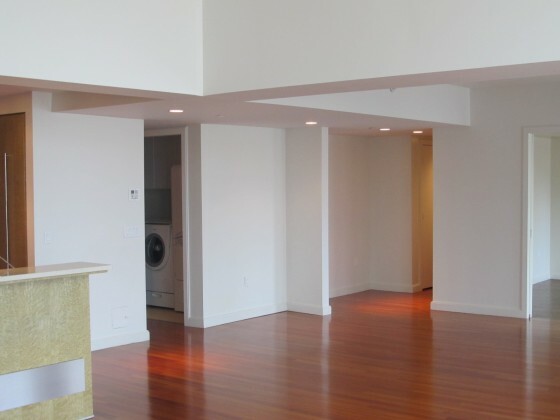 (The laundry room was relocated to another area of the condo.) These crucial steps significantly impacted the condo’s entire floor plan allowing for an open design that flows beautifully into the adjoining living and dining rooms. I integrated the cabinetry, appliances and millwork to achieve an attractive and functional design while accommodating the immovable ducts and pipes. 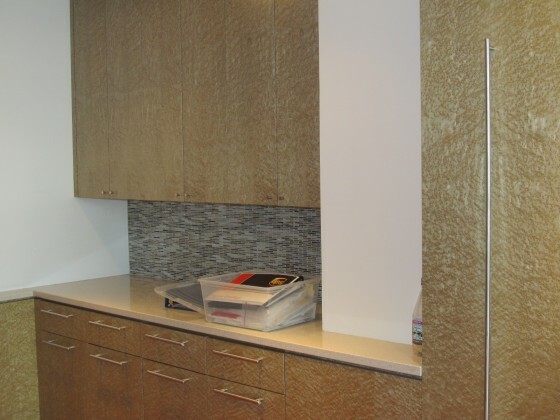 The kitchen cabinetry by Poggenpohl features an organic, textured laminate finish. 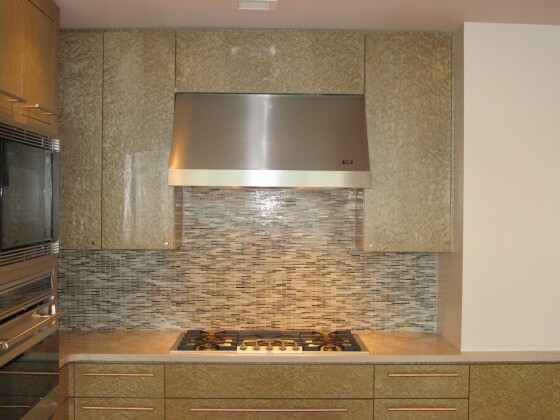 All new, upscale appliances were used to ensure top-notch functionality. 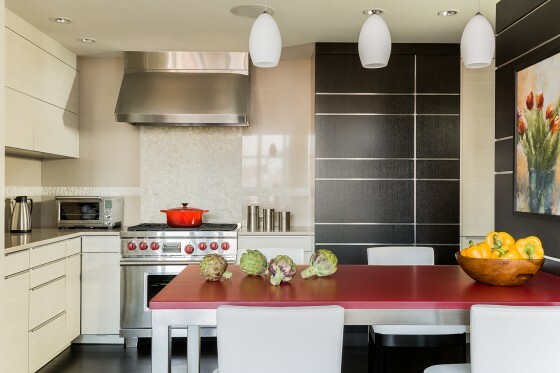 Caesarstone countertops and backsplash add to the kitchen’s sleek appearance, while the organic riverstone accents by Ann Sacks are a gorgeous feature above the stove top and as a stripe in the backsplash around the room. 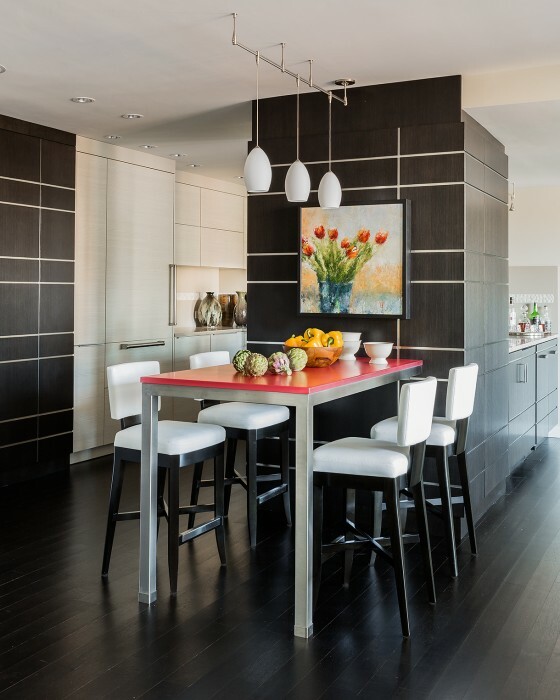 I also designed the kitchen’s rift oak custom millwork to create feature walls that add dynamic interest while coordinating with the look, feel and quality of the furniture in the home. 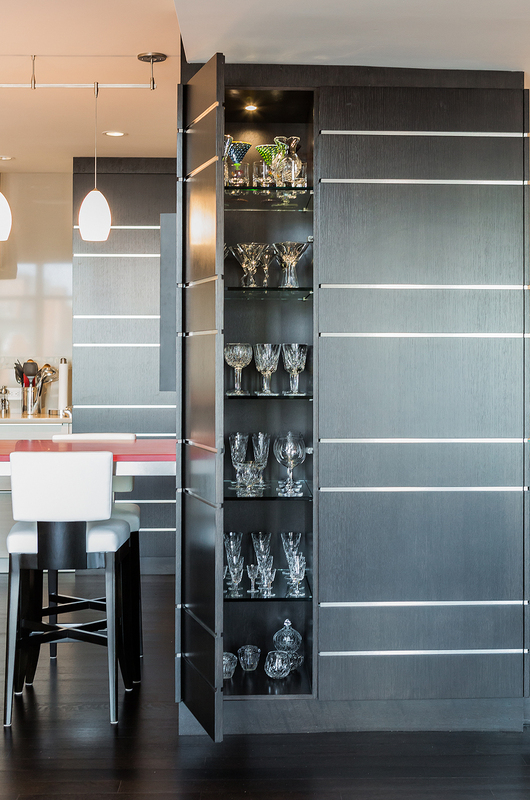 With its dark stain and stainless steel reveals, the millwork contrasts beautifully with the light colored , organic cabinetry for a stunning effect. The materials and details work together to achieve a contemporary, striking and sophisticated look and even provides additional storage. As the heart of the home, a kitchen shouldn’t be anything less than beautiful and functional. If this kitchen renovation has inspired you, contact Leslie Fine Interiors, Inc. in New England either online or by calling 617.236.2286 to discuss your own home design project. Whether you are considering a kitchen remodel or a whole-home renovation, I would love to work with you to create a custom design that caters to your needs, lifestyle and personal aesthetic.